The Crossover Universe: Crossover Cover: Creep, Shadow, Creep! Dr. Alan Caranac battles the evil sorcerer Rene de Keradel and his daughter Dahut, who was Caranac’s lover in their past lives in ancient Ys. Dr. Austin Lowell aids Caranac in his conflict with the de Keradels. De Karadel refers to Khalk-ru the Kraken God of the Uighurs. Alan Caranac also appears in Merritt’s story “The Drone.” Dr. Lowell first appeared in Merritt’s novel Burn, Witch, Burn!, and is also mentioned in James Ambuehl and Simon Bucher-Jones’ Anton Zarnak story “The Case of the Curiously Competent Conjurer.” Khalk-ru (or Khalk’ru) is from Merritt’s novel The Dwellers in the Mirage. Merritt's "The Drone" was mentioned in either Crossover I or II, if I remember correctly. I wonder if Khalk-ru the Kraken God could in fact be the Great Cthulhu? 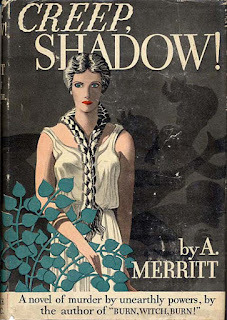 I haven't read much of Merritt but I've always meant. Do you have any suggestions where to start? I do remember reading a editorial in Asimov's Science Fiction by Robert Silverburg about Merritt where he bemoans him for being more or less forgotten.